In a two-part series, I take a look at the remaining outfielders on the 2016 free agent market and take a guess at their respective destinations. After Jason Heyward set the stage with his 8-year, $184 million dollar contract with the Chicago Cubs, the rest of baseball narrows in on the remainder of the outfield market. Today I look at the free agents and then the trade candidates. Gordon has had an interesting career. A first round draft pick in 2005, his major league début came with hype that rarely surrounded the Royals during that era. After two solid years in the majors, Gordon was swinging between AAA and MLB in his third and fourth years before breaking out in 2011 with his best year to date, finishing 21st in the MVP voting and winning his first of four consecutive gold gloves in left field. Since then he’s been the lynchpin of consistency for a Royals team that’s changed the atmosphere in Kansas City. Gordon is the first member of the Royals youth movement to hit free agency and he’s looking to cash in on that World Series win. Gordon’s a stellar defender who provides a solid OBP and 20-home run power. He’s gained a reputation as a solid clubhouse presence and is a proven leader that younger players can look up to. Gordon would fit well in the expanse of Citi Field, but the Mets need a center fielder and preferably a right-handed bat. The Royals payroll is already where it was last season so Gordon might be priced out of re-signing with them. The Cardinals have Matt Holliday in left and, if Gordon signed there, they would have to decide who stays in left and who has to move. The Angels have an opening in left, but they might look at the second tier or trade instead of spending even more money. Upton is in that phase of his career where people still see him as the 20-year-old phenom and expect Bryce Harper-like numbers. He’s not that guy. A 9-year veteran at age 28, Upton will be on his fourth team in five years; not something usually seen from guys who make it to the show before 20. He’ll still offer that right-handed thump in the middle of the lineup and still give you 20 steals, but he’ll sit around .270 if he’s having a good year. Upton is a solid player in the beginnings of his prime and any contract will lock him up for the best projected years of his career. The Giants might be financially eliminated from Upton’s asking price after the Johnny Cueto deal and the Orioles just picked up a cheaper but unknown option in Hyun-Soo Kim, the 28-year-old from Korea. Upton could be the piece missing from the Nationals lineup but could move MVP Bryce Harper to center. They want to keep Harper as healthy as possible because, well, it’s Harper. Again, the Angels have an obvious opening in left, but it’s just a matter of cap space. Cespedes had the most influential effect on a single team after the Mets acquired him from the Tigers. He singlehandedly changed the atmosphere in the Mets locker room and brought a winning attitude to a team that has longed for success, thrusting himself into the MVP conversation for just over two months-worth of baseball. Cespedes has been on four teams in two years, in Oakland, Boston, Detroit and with the Mets, and he’ll be adding a fifth to that list. 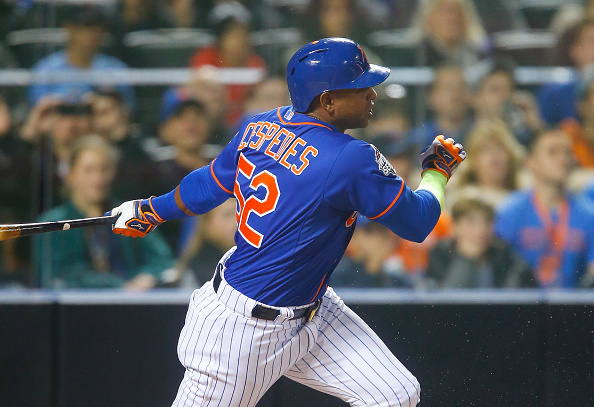 Cespedes is a bit out of the Mets price range but that’s where their biggest need is. Sadly, they’ll throw him in center again where he doesn’t quite fit, but he helps fill out their lineup nicely. The Angels and Giants, as mentioned above, have corner outfield holes. The Orioles are interesting after signing Kim, but could still piece together a solid, albeit right-handed, lineup with Mark Trumbo, Kim, Adam Jones, Manny Machado and Cespedes. Davis is a terrible outfielder. Still, Adam Dunn played outfield for a while and, well…. He’s a solid first baseman, but first base is an over-saturated market and it’s more fun to consider him as on outfielder anyway. Davis led the majors in home runs (47) and strikeouts (208), two of the three “true outcomes” a hitter can have. In a world where power is dwindling and pitchers are becoming more and more dominant, Davis’ power is growing increasingly more valuable. As an outfielder, Davis is the polar opposite of Gordon. Gordon provides defense and consistency, Davis provides flash and power. The Cardinals have second-years Stephen Piscotty and Randal Grichuk to go along with Holliday in the outfield, but first base is a platoon between Matt Adams and Brandon Moss. Davis would be a definite upgrade at first and could rotate into the outfield if need be. As for the Orioles, what I said about Cespedes also applies to Davis with this one bonus; Davis can play first and move Trumbo to the outfield. The Angels would sacrifice power for defense if they go after Davis with Albert Pujols and C.J. Cron at first base and DH, but Mike Trout can cover some of the ground Davis gives up. Fowler is the top center fielder in the market after manning center for the young Chicago Cubs. He was rumored to return to the Cubs before they signed Jason Heyward, so he’s the top second-option for teams that don’t want to sign the top-tier outfielders. Fowler played the most games of his career last year (156), after finally making it through a season without a DL stint, but teams may still be wary about giving him a long-term deal. Fowler plays a surprisingly average center field despite the natural speed he has. A weak arm doesn’t help and neither do his routes. He strikes out a lot for a top-of-the-order table setter, but provides enough power and speed to boost his value. The Mets have Curtis Granderson and Michael Conforto in the corners, so a center fielder fits their needs more. The Royals have Jarrod Dyson slated as their starting left fielder, but it’s doubtful he can hold his own at the plate over a full season. The Nationals have Michael Taylor in center and might want to see what he can do before bringing in someone from the outside and the Giants have been linked to Fowler, but the fit may not be quite there. Angel Pagan and Gregor Blanco can both play center, so a corner outfielder makes more sense.